The photo above shows my lovely Curvy Barbie® going for a stroll in the gardens around Montmartre in Paris, France. Yes, I really took my dolls with me to Paris, and if you’d like to watch their travelogue video, it can be found on my YouTube channel, ChellyWood1. Have you checked out my new Gallery Page, where you can pick an outfit for a doll, click on that picture, and the link in the caption will take you to all the free, printable patterns and free tutorials you’ll need to make that outfit? It’s awesome! If you’re looking for easier tutorials (esp. for those who’ve just started to sew), check out my playlist of tutorials for the beginning sewists on my YouTube channel. It includes video tutorials showing you how to do a basic straight stitch when sewing by hand, how to use the whipstitch to hem a garment, how to sew on snaps, and even how to design your own doll clothes patterns. 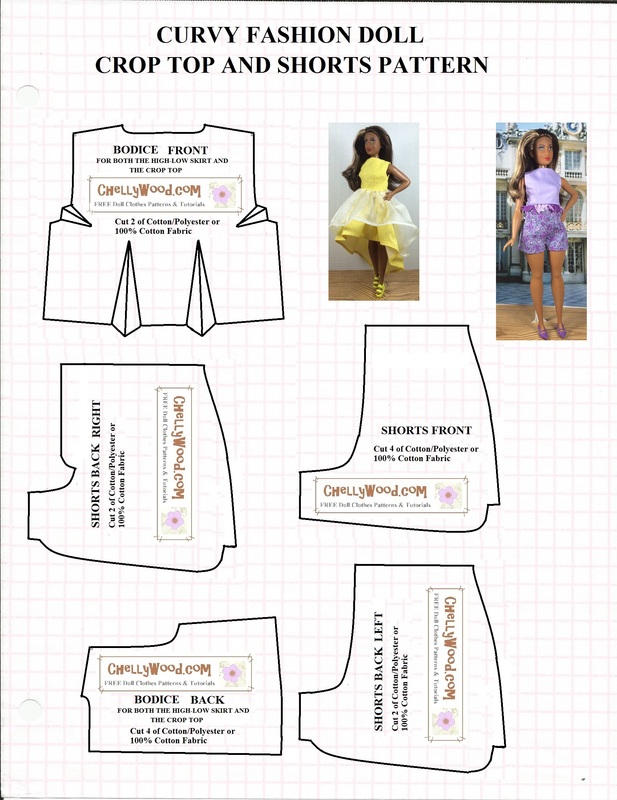 But it also has some easy sewing tutorials with free printable patterns too. Feel free to pin, like, or tweet about my free patterns and tutorials. If you’re wondering why I make patterns and tutorials without charging a fee, please visit the “Chelly’s Books” page, and that should explain my general motivations. And in case you haven’t heard, I have also designed commercial patterns for Lammily LLC. They have some new dolls in their line, including a new male doll, so you might want to visit the Lammily website to see what they’ve got going on.